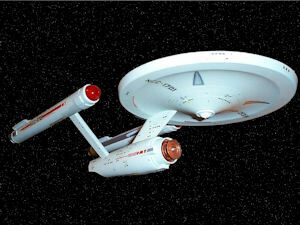 I first became really interested in Star Trek with the release of the first movie. I’d been aware of The Original Series, of course, but it never seriously caught my fancy. Maybe it was just that there was something about Kirk that irritated the living daylights out of me. 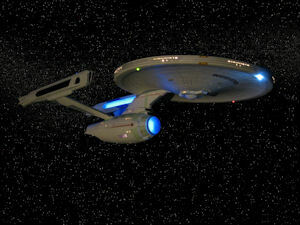 Anyway, when I caught sight of the rebuilt Enterprise, it was love at first sight. Then came The Next Generation and I was hooked. 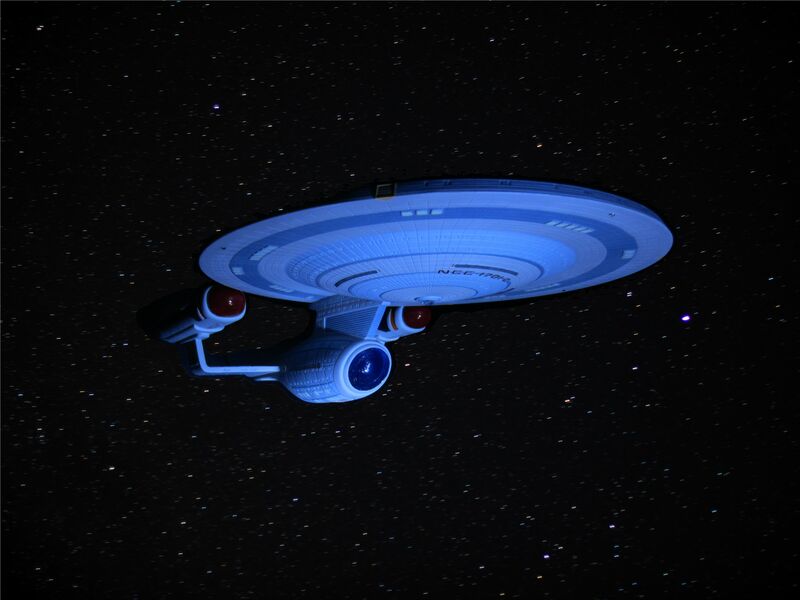 I’m trying to build models of each incarnation of the Enterprise. Here are my efforts (both model building and special effects) so far. The ship that started it all: the Enterprise from The Original Series. While I don’t think that this one is quite as lovely as the Enterprise-A, the design is a classic and one of the best starship designs I’ve ever seen. I built this one from the 18" AMT/Ertl kit, with a few extra parts (some bought and some scratchbuilt) and replacement decals. 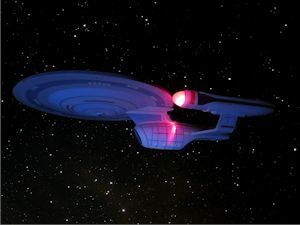 The ship that made me a Trekker. 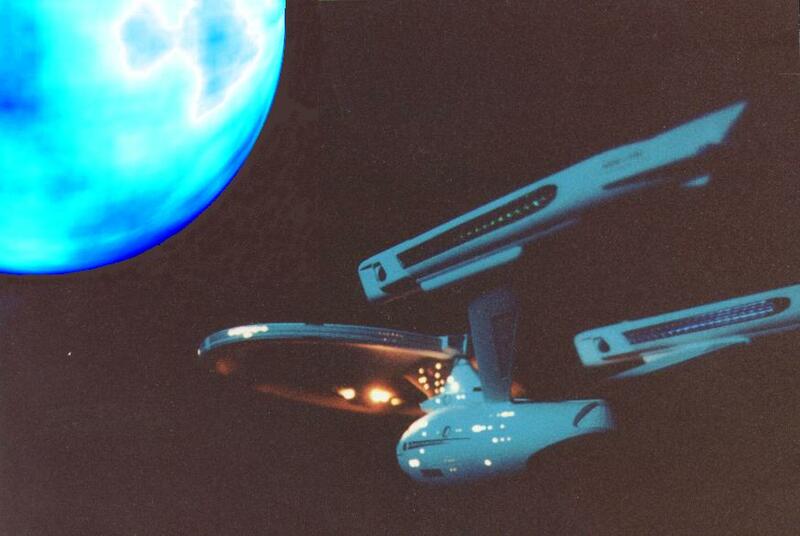 This version was built from the original Ertl/AMT kit with the smooth hull and iridescent warp nacelle stickers. I drilled out the windows and stuffed it full of grain-of-wheat lights. Unfortunately, the model didn’t survive my last move and these are the sole surviving photos. There were some problems with it anyway; I didn’t take into account the fact that all those lights generated a lot of heat and the “neck” joining the primary and secondary hulls melted a bit if the lights were on for more than a minute or so. These are some under construction views of my new version of the ship. It’s built from a later release of the Ertl/AMT kit so, of course, the hull is almost as much putty as it is styrene since I had to get rid of the cast-in panel detail. The running lights are LEDs and are controlled with a modified version of this circuit. 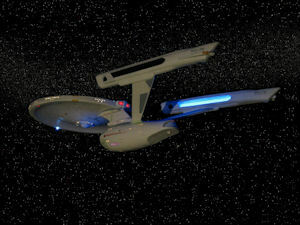 The warp engines and the navigational deflector are powered with Lightsheet®. I’ve added a number of resin replacement parts, mostly from DLM. Shortly after these shots were taken the ship slipped out of spacedock and broke both of the nacelle struts off the secondary hull. In reattaching the engines I damaged the detail on the front of the struts and got so disgusted with the project that I set it aside for well over a year. I didn't get back to it until the summer of 2009. I’ve finally finished this model. 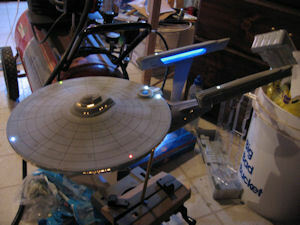 She’s decorated as the refit Enterprise from Star Trek: The Motion Picture. After several false starts trying to duplicate the Aztek paneling (one involving pearlescent paint and one with decals) I finally just gave her an overall coat of Polly-scale Reefer White. The accent colors were custom mixed using Testor’s Model Master paints. The decals came from JNT Graphics (by way of Federation Models), DLM, and a few that I custom made. Overall I’m quite pleased with how she came out. This ship was seen in the movie Generations and was a rebuild of the Excelsior studio model. In the movie, the Enterprise B is struck by an energy bolt, damaging the secondary hull. 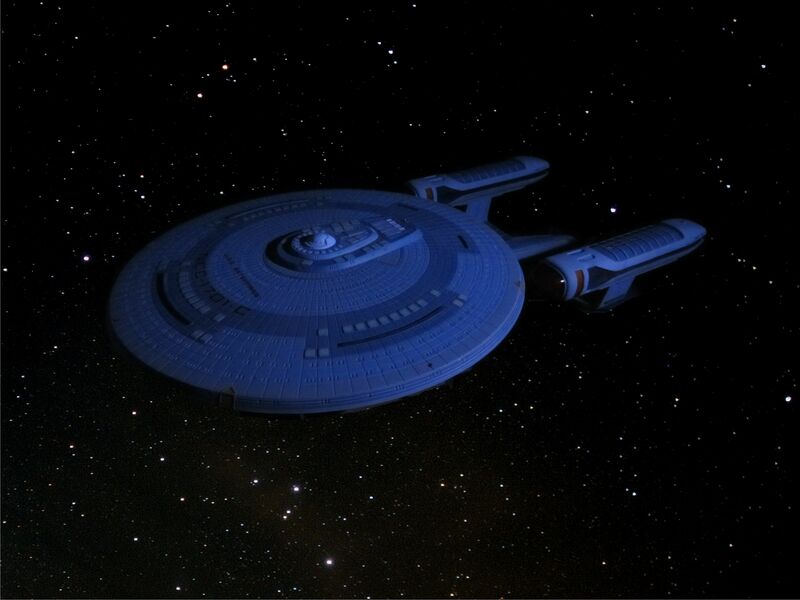 In order to avoid damaging the Excelsior model, the designers added bulges in the area to be damaged. This model is a fairly stock version of the AMT/Ertl kit. I did, however, scratch-build a new “neck” that more closely resembles the original. The Enterprise C was seen only once: in the Next Generation episode Yesterday’s Enterprise. This version (as was my previous version) was built from the AMT/Ertl kit, which is (as far as I could determine) a little more accurate than most fans think. There is one glaring error of commission, though: the “real” Enterprise C didn’t have the phaser strip on the lower side of the secondary hull. The kit also includes some “lights” that weren’t on the studio model: the ones on the forward end of the warp nacelles and the pair on either side of the aft end of bottom of the saucer. I follwed the painting instructions in the kit, which matched sources I found online, but I think the base color is just a bit dark. I used a combination of decals from the kit and from JNT Graphics. I also used MV Products lenses for the navigation lights. 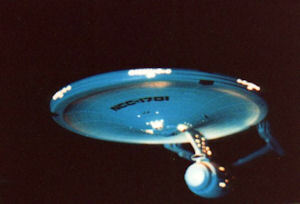 The Enterprise D was the largest version of the Enterprise and was featured in the 7 year run of Star Trek: The Next Generation. This version was built from the AMT/Ertl fiber optic kit, without the lights (I didn’t want to drill out all those tiny windows). I did replace the stock decals with a great set that I got from Federation Models. 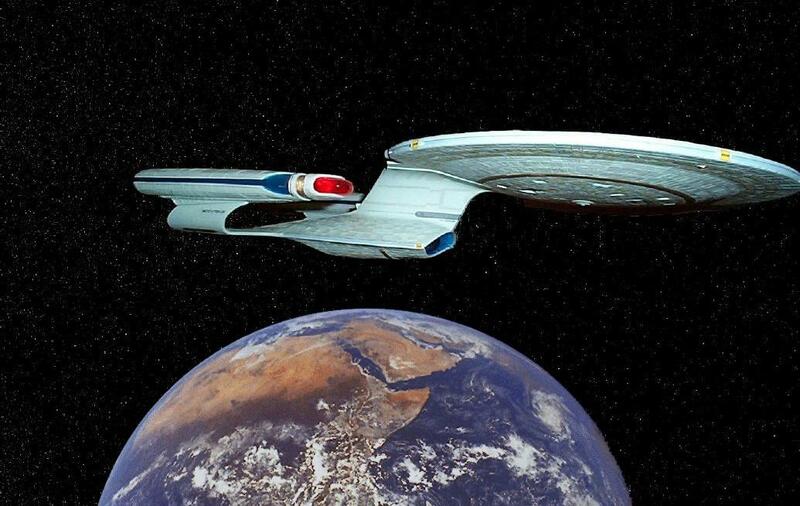 The latest incarnation of the Enterprise, built after the Enterprise D was destroyed on Veridian 3. 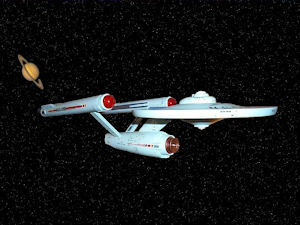 I’ve always felt that crashing the Galaxy class Enterprise was an unnecessary plot twist and I didn’t much care for the Enterprise E when I first saw it. Now that I’ve built the model, it’s really not so bad. I can definitely see the influence of Voyager’s design. 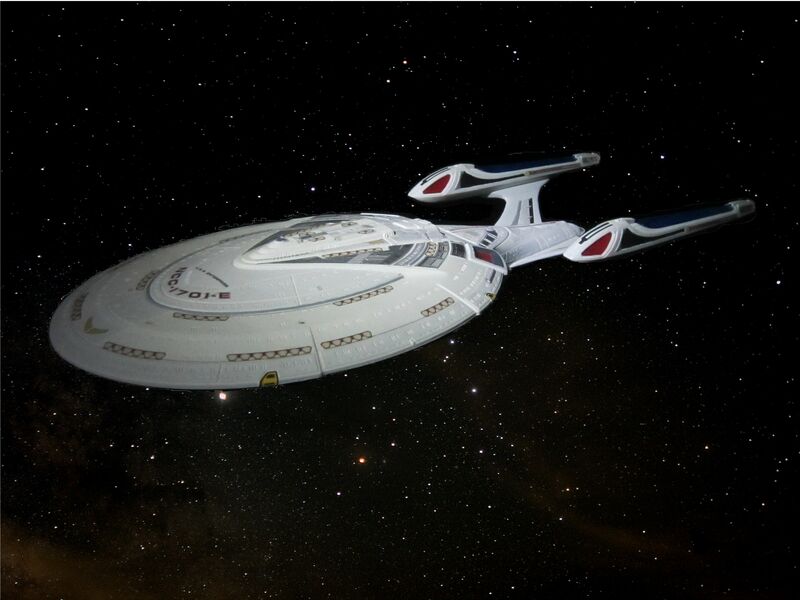 I built this one in the summer of 2012 from the AMT/ERTL kit with resin replacement nacelle struts and decals from several sources. Please send questions or comments about this site to Larry Z. Daily.